The new 2014 Ford Fiesta ST is reaching dealer showrooms in the UK, but since prices were announced at the end of January, over 1,000 customers have already placed an order. 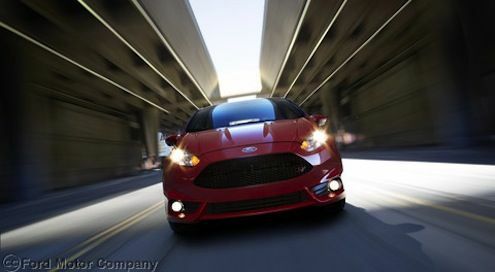 The new 2014 Ford Fiesta ST doesn't simply look like a performance car it's got the guts to back it up. UK buyers are lining up to get their hands on this highly anticipated hot hatch and have already placed 1,000 orders for the Fiesta ST since prices were announced at the end of January. And more than 90 percent of the initial orders opted for the highly specified ST2 model. The hot performance hatch’s class-leading driving dynamics combined with competitive pricing have catalysed demand for the new ST2. Why are more UK buyers choosing the Fiesta ST2? Over 90 per cent of customers in the UK have opted for the Fiesta ST2. The ST2 trim (£17,995 ) adds partial leather heated Recaro seats, EATC, Sony DAB radio, Ford keyless start, privacy glass and LED daytime running lamps. This is in addition to the standard specification 17-in alloy wheels, ST front fog lights, DAB radio, SYNC connectivity, Thatcham CAT 1 alarm, Recaro seats and My Key. The new performance Ford Fiesta ST packs a punch and is powered by a 1.6-litre Ford EcoBoost engine delivering 182PS and 290Nm of torque. It features an all-aluminium, four cylinder petrol engine which combines high pressure direct injection, low inertia turbocharging and twin independent variable cam timing. The new sporty hot hatch will sprint from 0-62 mph in 6.9 seconds. The performance Ford EcoBoost is fuel-efficient and is capable of returning 47.9 mpg (European cycle) and CO2 emissions of just 138g/km. The Fiesta ST sits lower than its tamer stablemate with a sport suspension with 15mm lower ride-height allowing better road performance and turning in the curves. It also features steering tuning and enhanced Torque Vectoring Control (eTVC) for more precise steering characteristics. The all-new 2014 Ford Fiesta ST and ST2 is proof that compact cars can be performance oriented, fuel efficient, affordable and anything but boring. The new 2014 Fiesta ST is priced from £16,995 and is available in UK Ford dealerships now. The U.S. version will be arriving on U.S. shores this spring.